US Datentext Share your Story - Nicht löschen! in all marketing material (such as press releases, websites, flyers, newsletters, posters, presentations) in all languages for distribution throughout the world. Apart from that, the data mentioned below will only be used to demonstrate that you have consented to the processing of your data (legal basis for processing is Art. 6 para. 1 phr. 1 lit. a, f GDPR). Your consent is freely given and you may withdraw your consent partly or entirely at any time for the future without providing reasons. It will not entail consequences if you do not give your consent. If you withdraw your consent, we will immediately remove your photo from our website and will no longer use it for the production of new marketing material. Further information concerning data protection may be found on our website under https://www.berlinheart.com/privacy-policy. Two weeks after Juniper’s birth, her parents took her to the doctor for her first check-up. Assuming they had a healthy baby, Juniper’s parents were shocked when the doctors discovered that her heart was twice the size it should be. Juniper was diagnosed with dilated cardiomyopathy, a disease in which the heart becomes severely enlarged. Thus, the heart does not adequately contract and therefore cannot pump enough blood to her body. In Juniper’s case the left ventricle performs only one sixth as efficiently as compared to a normal child’s heart. As her heart could not support her sufficiently, Juniper needed a new heart. Juniper was listed for a heart transplant when she was only three weeks old. 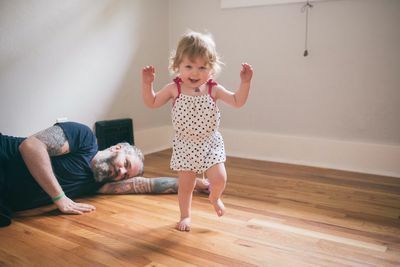 Juniper was initially able to be treated with medication and was able to go home with her family but after only about two weeks, her condition deteriorated fast. The physicians at the Children’s Hospital in Denver, Colorado decided to implant Juniper the EXCOR® Pediatric ventricular assist device (VAD) made by Berlin Heart especially for children. The surgery took place on April 10th 2014, when Juniper was just seven weeks old. So far she is the youngest baby at Children’s Hospital Colorado to receive a Berlin Heart. 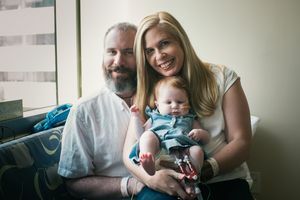 Juniper’s mother, Joni, remembers being concerned when she first heard about the Berlin Heart device as she was unsure of whether Juniper could act like a normal baby while supported by the system. Her parents soon realized that she can. Despite a complicated early course, Juniper was thriving and developing like every other child of her age while waiting for her new heart. After six months of waiting, a suitable donor heart was found for Juniper and transplanted on September 17th 2014. After another eight days she was released from the clinic so that her parents could finally take her home. A moving film from Juniper's parents to the parents of their organ donor can be found here.